The foot is the key to the solution of the most common back, knee, vein, and foot problems as well as the prevention of overweight and falls at an advanced age. This is due to the fact that most problems of the musculoskeletal system (signs of overexertion in the front and back area of the foot as well as knee, hip and back problems) start at the foot. This can be demonstrated schematically by means of two bottles. When the bottle is on the ground, it is stable. On ever sky scraper the foundation is the widest part and the construction becomes narrower towards the top. The foundation must still be buoyant and dynamic to be able to withstand an earthquake for instance. Just like the sky scraper, the foundation (the foot) must be the strongest component of the human body to keep it in good shape for a long time to come. 100 years ago, man walked 15 km a day, today just 800 m. In the present time, people spend the day mostly sitting down. This does not only lead to an insufficient training of the foot but also to shortening of the muscles, imbalances and tensions in the entire body. Daily exercise is essential for strong feet, a relaxed musculature, and healthy joints. Apart from the quantity of movement, the quality, i.e. the correct pressure on the joints and the spinal cord plays a vital role. 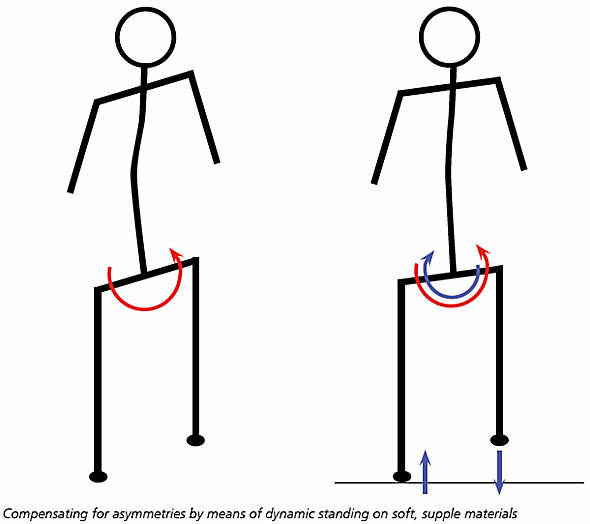 Hereby two gait and posture patterns can be distinguished: the foot-oriented gait and the hip-oriented gait. What the engine is for the car, the muscles are for the human musculoskeletal system. The muscles move the joints. The muscles which power the foot, knee, and hip joints, supply the main contribution to the locomotion of the human gait. Without arms man could not move along so fast and dynamically. A runner without arms would be slower and would get neck pain because the impetus of the arms contributes in no small measure to loosening the neck muscles. This way, each muscle contributes to the propulsion of the human gait but the two main motors which contribute to the gait are the foot motor and the hip motor. Civilized man moves on flat streets in mostly heeled footwear. This limits the mobility of the foot joint and therefore inhibits the foot motor. Arch supports further block the movement of the foot. When the foot is limited in its mobility, the hip motor compensates in order to still move forward fast and forcefully. For this reason, civilized man mainly uses the hip motor for walking. Thigh muscles are activated to take one step forward and to more or less put one foot in front of the other. Hereby the foot motor is less active then when the primitive people walk barefoot. As a reaction to intense hip activity, the hip flexors pull the upper part of the body forward which, after some time, produces the typical, forward bent old-age gait with shortened muscles, tension, strain on joints, and relieving postures. On the other hand, a strong, foot-oriented gait straightens the posture, stretches and relaxes the muscles, evens out imbalances, and breaks the vicious circle of relieving posture and over stress. 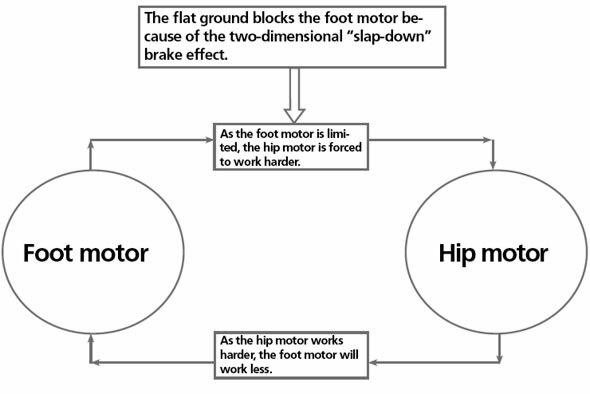 When primarily the hip motor is active and the foot motor limited, the foot motor switches itself off completely after some time. This “switch” is often visible in the gait of older people. They just lift the hip and use the foot only to put it down. Not the foot is moving the body forward but the force of the hip. The hip is very active, whereas the feet, which should actually be the main motor, are practically no longer functioning. A lifelong of high hip activity often results in over stress in the hip and lumbar vertebra areas. Blockages in the iliosacral joint are the result. This is called a hip-oriented as opposed to a foot-oriented gait pattern. Flat surfaces and heeled shoes limit and weaken the foot. 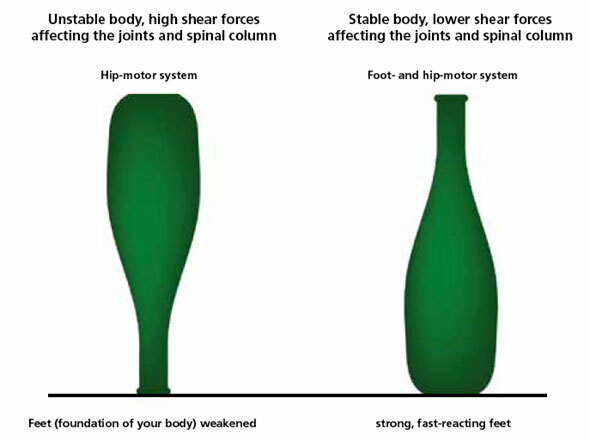 The shear forces (horizontal forces in the joints) are very strong. Musculoskeletal system disorders, e.g. back and joint problems, inflammation of the Achilles‘ tendon, and over stress of the foot, are mostly caused by a weak foot and unnatural gait and posture patterns. When walking barefoot on natural, uneven ground, foot motor and hip motor interact in an ideal way. This is shown by observations of primitive people who move as nomads on natural ground. They have a tall, slim stature and show an even musculature, as well as an upright posture. Their foot motor does most of the work. The hip motor rather turns backwards, i.e. the thighs push away to the back more than pulling the step forward. The natural cooperation between the two motors allows the musculoskeletal system to stay healthy as long as possible. A switch to a natural, foot-oriented gait is recommended for everyone. When changing the gait and posture pattern the reactivation of the foot motor as well as the loosening of the hip motor is the priority. The body straightens up. The hip motor is naturally integrated in the propulsion system. 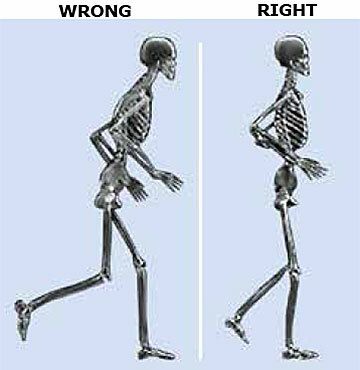 With the switch to a foot-oriented gait, there is a great chance that complaints about the musculoskeletal system are soothed or vanish altogether because the cause of the complaints, an incorrect gait and posture pattern, is herewith eliminated. This change in the gait and posture pattern can be demonstrated with the Leaning Tower of Pisa. Should you want to straighten the Leaning Tower of Pisa, its foundation would need to be straightened from the bottom using a considerable amount of strength. Man functions unequally on the right and the left side. Therefore, the right and left hand, as well as the right and left foot are different with regards to strength and coordination. Each person has a supporting leg and an jumping leg. Out of habit, man always stands on the same leg. Because civilized man walks on flat, hard surfaces most of the time, the strong foot becomes stronger and the weak foot weaker. The asymmetry is increased. This can lead to vast differences between the left and the right regarding strength and coordination. This uneven strength in the left and the right leg is joined in the iliosacral joint and the hip area and can lead to a functional pelvic obliquity which can look like uneven length of the legs. As a consequence scoliosis, tension in the lumbar vertebra area, over stress of the back, hip and knee joints as well as of the feet can appear. 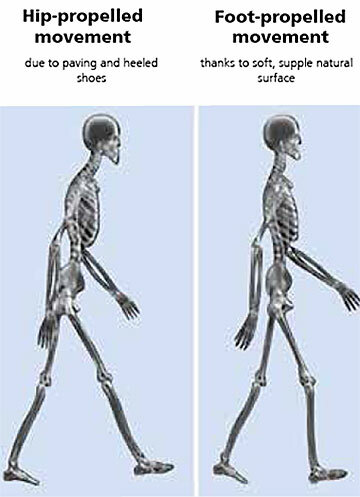 Would man walk daily on natural ground, the asymmetry of feet and legs would be evened out. The left and the right foot motor would be evenly trained so that both feet work likewise. The transition to a foot-oriented gait and posture pattern is made possible by elastic materials. How the special characteristics of this material strengthen the foot is explained in the following chapters. In the kybun shoe, the foot stands directly on a elastic cushion, which gives the foot the freedom of movement in all directions. Through the elasticity and the instability upwards, downwards, to the outside and inside, the musculature is optimally trained. The joints are spared and the back musculature relaxed as in no other foot gear. The kybun shoe is an everyday shoe which can be worn the entire day. It is particularly suitable for people who stand at work or have physically strenuous jobs. The elastic kybun sole (air-cushion sole) prevents heavy legs, burning feet, back pain, and vein ailments. Because the elastic material always dynamically adapts to the form of the foot’s sole, the kybun shoe is also ideal for all foot problems. For athletes the kybun shoe is suitable for warming up and for cooling down after training or competitions. When changing the gait and posture pattern with the kybun shoe, the body reverts to the total stretching, completely executes the movements again, and carries out the movements completely. Due to this sudden change, initial reactions can occur. For all medical indications, overexertion, irritations or even inflammations can occur due to the changed stress on the “weak spot”. It is recommendable to wear the kybun shoe with care for the first few days to see whether the body shows any initial reaction. In case of reactions, it is advisable to precede according to the recommendations of the indication descriptions, to only slowly increase the training in the kybun shoe and to regularly repeat the relevant exercises. Click here for medical indications for kybun shoes!